If there’s one thing we’ve learned over the years from movies, you just can’t trust a super computer. From 2001: A Space Odyssey to the more recent War Games, they seem hell-bent on destroying their creators (us). The same is true with Capcom’s latest action-packed shooter, Legendary Wings, where a super computer named DARK has malfunctioned and built all sorts of enemy ships and robots to take out the human race. Will our two heroes straight out of Greek mythology be able to gun down all of the evil minions before it’s too late? If guns don’t get the job done, may I suggest a friendly game of Tic-Tac-Toe? Or maybe we should send Kyle Reese back in time to stop DARK from ever being built? Maybe that’s a storyline for a sequel! When the gameplay is solid and the graphics and music offer up something special, there’s really no need for a deep backstory. Honestly, most people who play Legendary Wings won’t care about the storyline because it’s a fast paced shooter that’s twice as fun with a friend. Now, I know what you’re thinking – yet another space shooter on the NES? And after what seems like 30 such games releasing last year I completely understand your reticence to giving yet another one a shot (pun intended). However, Capcom has come up with some enticing gameplay mechanics that haven’t been seen on the NES yet. First up, it should be noted that unlike most shoot’em ups, Legendary Wings features both vertical and horizontal scrolling levels. The first stage features a viewpoint from above the characters flying vertically up the screen. Waves of enemies will come flying onto the screen and if you’re lucky some of them will drop a power-up pellet. The game features a really awesome weapon progression system. If you grab one you’ll upgrade your Single Shot to a Twin Laser. If you manage to avoid getting shot by enemies and grab an additional power-up you’ll rank up to a Penetration Shot, which is very powerful and delivers 3 times the damage of a normal shot. Continue to fly like an ace and avoid enemy bullets and you can upgrade your weapon again to the Flame Shots, which shoots in 3 directions delivering epic firepower to your foes. Now, what’s really cool is that normally if you would get hit by enemy fire you’d die, but if you have upgraded your gun you can get hit and all that will happen is you’ll downgrade to the weapon you had prior. If you keep getting hit and then are back to the original Single Shot and then get hit once more you’ll lose a life. However, if you power-up to level five, you’ll turn into a Firebird, giving you 4 times the damage and you can get hit three times before being demoted back down to the Flame Shots. As you can tell, it’s in your best interest to upgrade your weapons as quickly as possible. In addition to your main gun, in the overhead sections you also have a missile. These are good to attack things on the ground and also to deal extra damage to enemies. You’ll want to shoot everything that comes onto the screen, even structures. That’s because you can come across secret underground compounds – some of which you’ll want to avoid (Minus Stages) because they’re filled with difficult enemies, and others that you’ll want to seek out (Bonus Stages) because they’re filled with points and power-ups. No matter which one you go into, the game changes to a horizontal scrolling side view, similar to Gradius. Many times the level will have branching paths and you’ll want to avoid getting stuck behind walls and other hazards. Once you’ve completed the underground level you’ll be whisked back above ground and the viewpoint will change back. At the end of each level will be a boss that will take many hits to destroy. One of the most appealing factors of the game is its support for two players at the same time. I love that more NES games are releasing with this feature, as it’s never fun to have to wait and take turns. This being a Capcom game there’s quite a bit of flicker and slow down with multiple people playing and tons of enemies on the screen. It’s something we’ve become accustomed to on the NES and with this developer in particular. Although some might be annoyed by the performance, my friends and I got used to it rather quickly and would much rather take the hit in graphics if it means we can play together. Graphically Legendary Wings is rather pleasing to look at and a lot more colorful and detailed than most NES shooters. I really like the Greek mythological architecture mixed with futuristic robots and beasts. There’s not anything quite like it on the system yet, and the combination of overhead and sidescrolling views keep things exciting and fresh. The underground lairs are more detailed and give a better look at our flying heroes. The soundtrack is also something special and it’s recognizable as a Capcom production just by the instruments being used in the background music. It sounds very similar to Mega Man and some of the other games from the company, and that’s a good thing. It seems as of now some of my favorite NES music has been found in Konami, Capcom, Nintendo, and Sunsoft games. I know some gamers out there probably mute their TVs when playing video games, but with the sound technology so far ahead of what we’ve had in the past, that would be a shame. 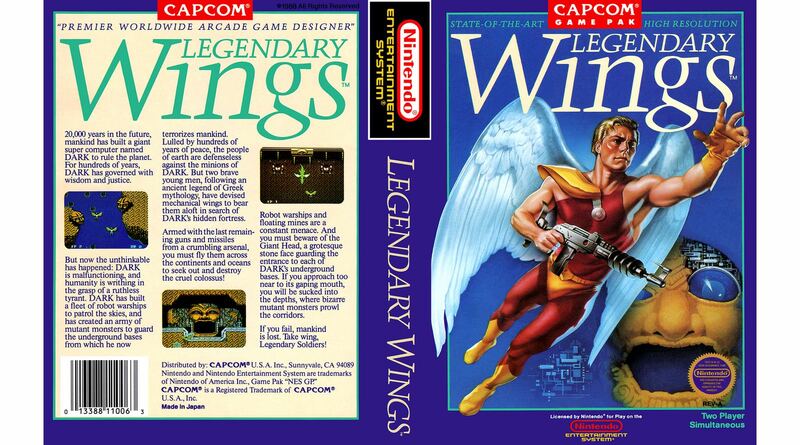 Like many shooters on the NES, Legendary Wings can be a bit challenging at first. Playing co-op definitely takes helps lower the difficulty and finding and memorizing enemy patterns will come in handy. With a fun and unique power-up system, the ability to earn continues and find bonus rooms filled with stuff, the horizontal and vertical scrolling levels, and the unique set pieces, this Game Pak stands out from the rest. The only negatives are the excessive flickering and slow down and the game isn’t all that long (5 stages). Still, it’s a load of fun with friends and one of the best shooters the NES currently has to offer.